You are invited to participate in a Community Intake Conference for Hyatt House Hotel. This conference welcomes career seeking individuals who are in search of a position in the construction industry. 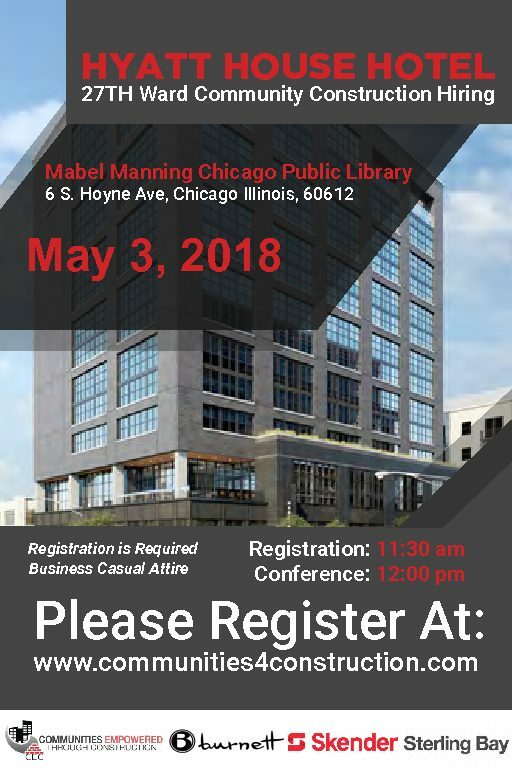 The Conference will be held Thursday, May 3, 2018, at Mabel Manning Chicago Public Library located 6 S. Hoyne Ave with registration starting at 11:30 a.m.-12:00 p.m. and the formal presentation immediately following at 12:00 p.m. Registration at 11:30 is only for those individuals who have NOT completed the online application. If you have completed the online application, please feel free to arrive around 11:20a.m. to check in.